The Paley Center for Media celebrates the thirtieth anniversary of one of television’s longest-running and most-anticipated summer franchises with an all-new, interactive, multimedia exhibit that gives visitors a chance to dive in to three decades of jaw-dropping shark stories and groundbreaking scientific discoveries. Every July sharks invade the airwaves when Discovery Channel airs SHARK WEEK, television’s longest-running and most-anticipated summer event. SHARK WEEK: 30 Years of Shark ‘N’ Awe! The Exhibit gives visitors a chance to dive in to three decades of jaw-dropping shark stories and groundbreaking scientific discoveries. Relive the annual ‘fin-tastic’ celebration’s greatest moments through compelling video, never-before-seen photography, props, and costumes, including NBA legend Shaquille O’Neil’s custom wetsuit from the 2018 promo campaign. Get an up-close look at Shark Week’s popular mascot, “Chompie, Jr.” and take your own Shark-themed photos to share on social. And see exclusive artifacts from the annual event that has taken viewers to unexplored locations and provided them with extensive insights into the mysterious world of sharks. 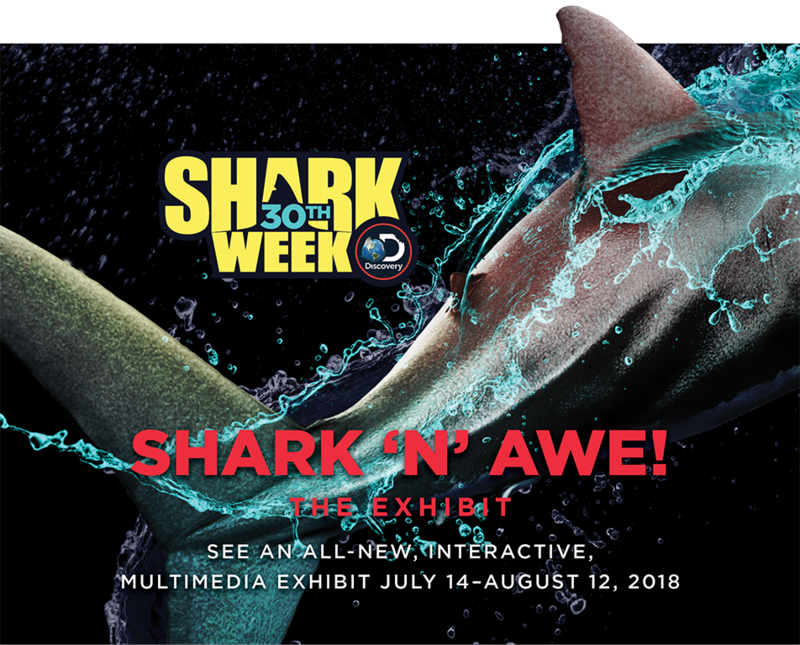 And rounding out the experience will be an interactive display where visitors can test their knowledge of SHARK WEEK’s thirty year history through an exciting trivia challenge. “SHARK WEEK is a pop culture phenomenon and summer’s most eagerly awaited television event. In celebration of SHARK WEEK’s 30th anniversary, we’re thrilled to share our love of sharks with the Paley Center for SHARK WEEK: 30 Years of Shark ‘N’ Awe! The Exhibit,” said Nancy Daniels, Chief Brand Officer, Discovery & Factual. SHARK WEEK’S 30th anniversary celebration will kick off on Discovery Channel on Sunday, July 22 and will continue through July 29, featuring a packed celebrity lineup and unprecedented access to some of the most exotic places in the world.